TPU received pictures of the Inno3D GeForce GTX 680 TwinFan, a new custom-design graphics card that promises easy cleaning thanks to a cooler that can be detached with thumb screws. 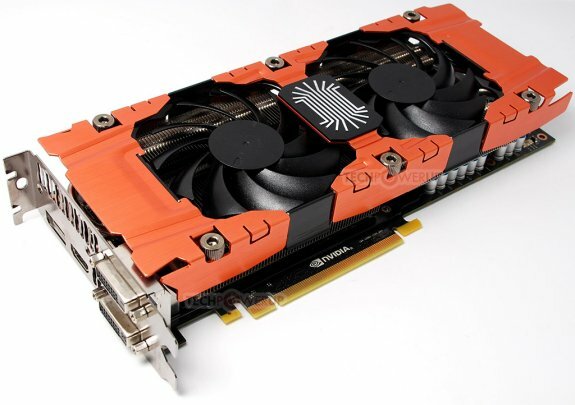 Pictured below, the card features an in-house cooler design by Inno3D, which has a racy-looking metallic-orange cooler shroud, and two fans ventilating it. It could feature a conventional heat pipe-fed heatsink underneath. It's also possible that Inno3D is sticking to NVIDIA reference-design PCB. The cooler shroud, according to Inno3D, is detachable without much effort, which enables end-users to keep the heatsink below it clean, and maintain high cooling performance. The fans are also said to spin at low speeds, resulting in lower load noise levels than NVIDIA reference cooler. More details are awaited.